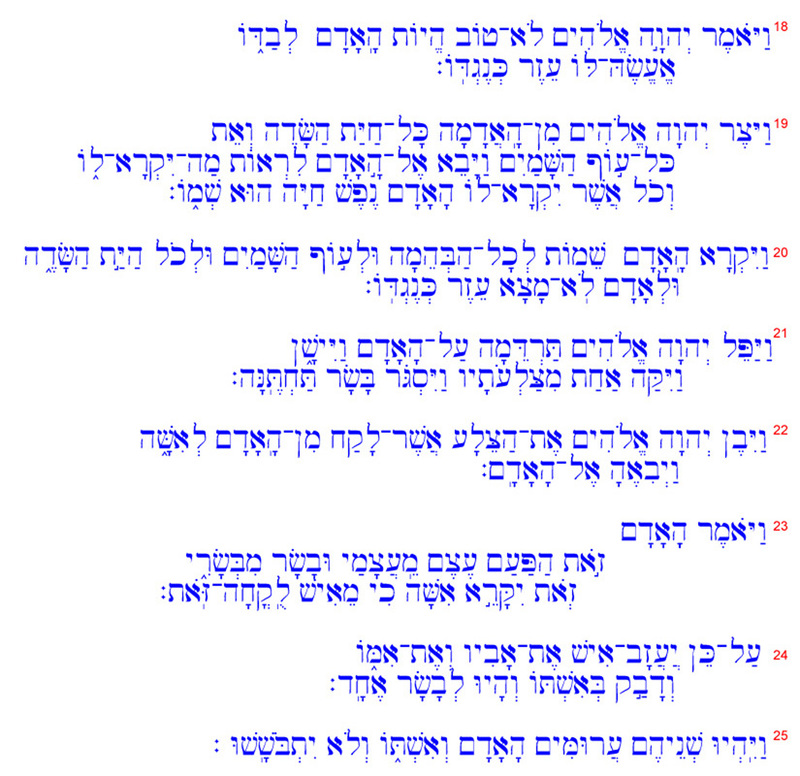 The following three passages in Hebrew are from the Book of Genesis and describe God's creation of man and woman. The first passage is Genesis 1:26-27, which relates that God created mankind in our image and likeness. The idea of human dignity, that we are created in the image of God (1:27), supports the theological basis for human equality and the fundamental principle of liberty in Western Christian civilization, as written in the Declaration of Independence of the United States of America. The expression "our image" has led to great speculation as to its meaning. 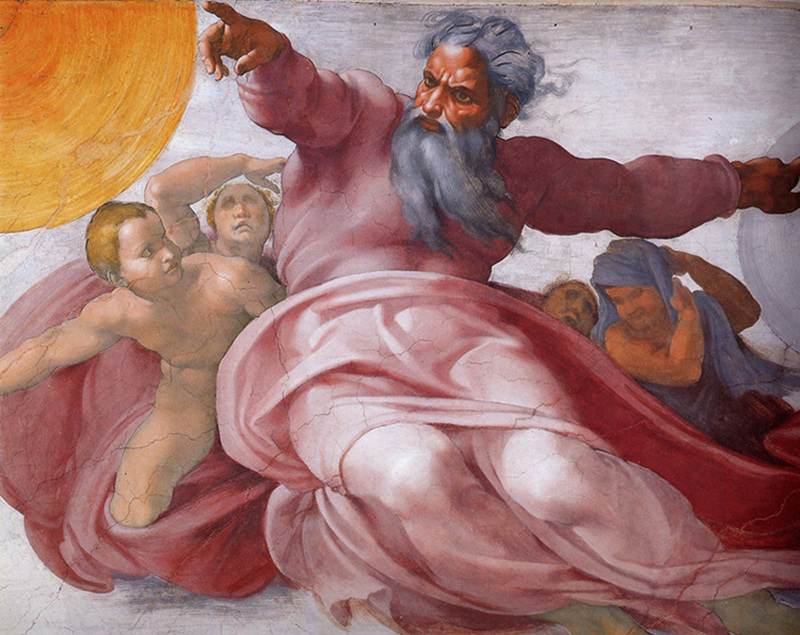 Is the expression the "royal plural," or is God the Father as King of Heaven addressing his heavenly court? Some Fathers of the Church believed it raised the possibility of the Holy Trinity. The name of Father, Son, and Holy Spirit was revealed by Jesus Christ in the New Testament of the Bible (Matthew 28:19-20). Note that the word בָּרָא - bara', the Hebrew word for create, is written three times in 1:27, the first time in the waw-consecutive form וַיִּבְרָא - and he created. God blessed man and commissioned man to be fruitful and multiply, to fill and rule the earth. The second passage is Genesis 2:7, which records that God fashioned man from the dust of the earth, and gave him the breath of life to make him a living being. The Hebrew word יָצַר - yatsar, means to form or fashion, and in the waw-consecutive וַיִִּיצֶר - and he formed. The third passage is Genesis 2:18-25, where God noted that "it is not good for the man to be alone." Whereas it took God only one line to form man, God spent several lines to create woman! It is natural for a man and woman to unite in love and harmony for continuity of God's creation, the human race. God gave the man the authority to name everything, a sign of dominion over the world. God gave us the breath of life. Our dominion over the earth implies responsibility. It is for us to treasure life and the earth. 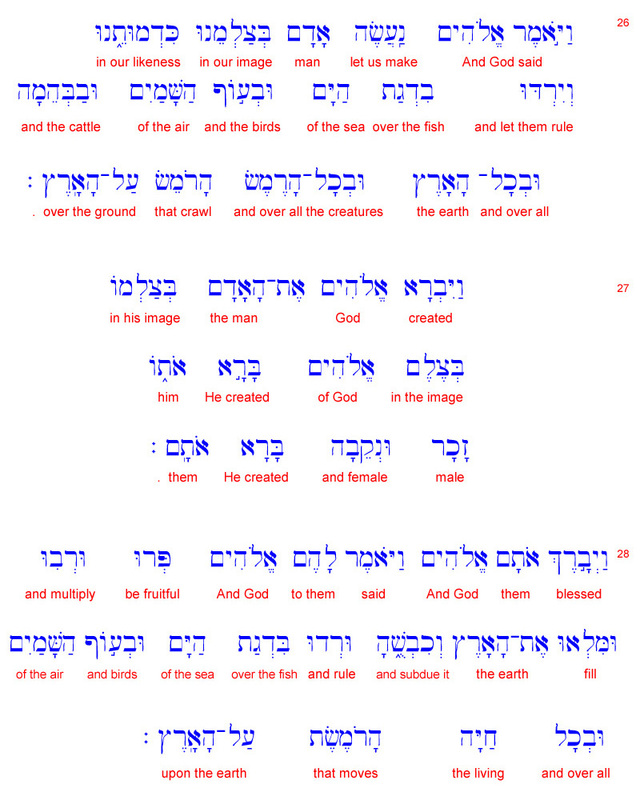 A unique feature of Biblical Hebrew is the use of the waw-conversant or the waw-consecutive form of a verb in a narrative, as in these passages from Genesis. For example, the word in line 2:22 is וַיִּבֶן - and he built, the waw consecutive of בָּנָה - banah, to build. The waw-conversant is formed by the Qal imperfect of a verb with the waw prefix. While the imperfect generally conveys the future, the addition of the waw converts the sentence to the past. Likewise, the addition of the waw to the Qal perfect, which normally conveys the past, converts the sentence from the past to the future. Another feature of Biblical Hebrew is the construct relationship of two nouns joined together to express the genitive case, as there is no preposition in Biblical Hebrew to express the word of. 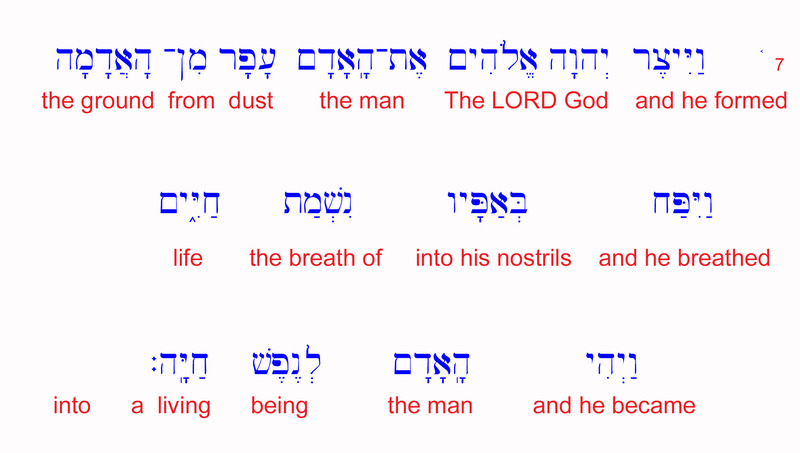 For example, in the expression נִשְׁמַת חַיִּים - the breath of life, the first word נִשְׁמַת is in the construct state, and the second word חַיִּים is in the absolute state. Please note that the construct form of a noun is often different from its absolute state (see Key). An interlinear translation is provided for the first passage. Remember Hebrew is read from right to left, so the English translation follows the same pattern. To encourage you to read the actual Hebrew, the next two passages have the key or the translation to follow the passage. The links at the end will provide further information. but for the man there was not found a helper fit for him.